The Church is the spiritual body of Christ, a group of persons called out by God and impregnated with His Holy Spirit. As a spiritual body, the Church is made up of baptized, spirit filled individuals who are scattered around the world. As a physical, external organization, the Church has meeting places in many areas worldwide where members and non-members alike, as well as. children and guests, meet in harmony to worship God and to learn His Way under the guidance of an ordained minister as their spiritual elder and leader. The main commission of the Church is to preach the gospel as a witness to the world and to baptize and spiritually nurture those whom God has called. While God at times has dealt with particular human beings on an individual basis, He has normally worked through the congregation of Israel; in New Testament times this became "spiritual Israel" or the Church. The Greek word for "church" (ekklesia) is a common noun meaning group, "crowd" or "assembly." It is used collectively of the group of persons with whom God is dealing and in whom dwells God's Holy Spirit. The New Testament Church was originated and developed through Jesus Christ and the preaching of His twelve disciples who were later called apostles. The Church dates its origin from the first Pentecost following Christ's ascension as explained in Acts 2. Here Luke records the assembling together of Christ's disciples, the outpouring of God's Holy Spirit upon them, and the consequent conversion of 3,000 of them who believed in the gospel and person of Jesus Christ. From this point on, "the Lord added to the Church daily such as should be saved" (Acts 2:47). A number of metaphors or analogies are used by the Bible to clarify the organization of the Church and to explain the place of the members within it. 1 Corinthians 12 describes God's Church as a unified organism with the various members depicted as various parts of the body with various responsibilities, administrations and duties. Each member has an important contribution to the overall well-being of the whole body; each has his own unique part in enabling the whole body of the Church to accomplish its ultimate objectives. The Church is also referred to as a spiritual building (1 Cor. 3:9-17) and as a family-the members being spiritually related one to another (Eph. 3:15). They are called the siblings of Christ (Rom. 8:29) who, as their elder brother, leads them and directs them in their way (Heb. 2:10). The name most often used by the Bible to refer to God's Church is "the Church of God" (1 Cor. 1:2; 2 Cor. 1:1; Gal. 1:13; 1 Tim. 3:5; etc.). In accordance with this biblical example, we are named the "Church of God"-adding the description "Intercontinental" to form our official corporate name, "Intercontinental Church of God" in order to differentiate ourselves legally from other groups who call themselves "Church of God." Our name also delineates the scope of this Church. The Church is also pictured as Christ's bride. The members live in a state of expectation and preparation for the return of the divine bridegroom (Eph. 5:22-32; Rev. 21:9). The bride is striving to prepare herself to be acceptable to Christ by the process of spiritual growth, in order to become perfect and to measure up to the full stature of the bridegroom, Christ. Becoming a part of the Church of God is not an incidental matter. A person is first called of God (John. 6:44), given an invitation as it were. Before accepting, Jesus said a person should "count the cost" (Luke. 14:28), because the Christian life is often difficult. When a person accepts this calling, he must repent of his past sins and go through the ordinance of baptism by immersion. This symbolizes the washing away of all his past sins. Then, with the laying on of hands by the ministry, the person receives the begettal of the Holy Spirit. His covenant with God is now signed and sealed. At this point a person becomes a full-fledged member of the Church of God. He becomes a Christian, a "saint," a begotten child of God reserved for the resurrection. Members of the Church are exhorted to become a cohesive family unit. Judging each other (Rom. 14:13), making spiritual comparisons among themselves (2 Cor. 10:12), forming cliques, favoring one minister over another (1 Cor. 1:11-13), gossiping, etc. are all divisive and counterproductive of collective goals. What Christians should strive for is working together to further the preaching of the gospel, serving the poor, helping weak brethren, encouraging the dejected, visiting the sick, aiding the elderly, bearing each other's burdens; these are the fundamentals of Christianity and produce a strengthened church. The Church constitutes the body of Christ, a spiritual entity (Col. 2:19). As such, "the Church" is not merely a building, or even strictly speaking a physical organization of persons who have "joined" the Church by having their names placed on a computer listing. It is rather that group of persons in whom dwells God's Holy Spirit. "For by one Spirit are we all baptized into one body, whether we be Jews or Gentiles, whether we be bond or free; and have been all made to drink into one spirit" (1 Cor. 12:13). Likewise, Romans 8:9 states that "if any man have not the spirit of Christ, he is none of His." Although any person in whom God's Holy Spirit dwells is by definition a member of God's Church, it is nevertheless erroneous to assume that any and all nominal Christians are actually part of God's true Church. The Bible also maintains that: "There is one body and one Spirit, even as you are called in one hope of your calling; one Lord, one faith, one baptism..." (Eph. 4:4-5). One area where the Intercontinental Church of God has been accused of deviating from the early New Testament Church ironically demonstrates just the reverse. The claim is sometimes made that while the early church preached the doctrine of grace through Christ, the Intercontinental Church of God preaches the doctrine of obedience to the Law of God. Though often distorted-e.g. the Church does not preach that salvation can be earned (see the appropriate doctrinal statements in this ICG Correspondence Course)-there is an element of truth here, and a significant element at that. To understand the critical parallelism, it is necessary to first compare the religious environments of first century Judaism in which the early church began with twentieth century Christianity in which the Intercontinental Church of God began. Judaism of the first century was extremely strict by modem standards; its teachings were well known and stressed the enormous importance of keeping not only God's law but numerous additions to that law as well. In this environment, it would have been ludicrous for the early apostles to emphasize the need to keep God's Sabbath, for example (see Sabbath). They stressed what was new and revolutionary-that salvation was a free gift and could not be earned, that Christ's death paid the penalty for sin, that forgiveness and grace was available through Christ, that Christ was resurrected, etc. Today, the religious environment is almost diametrically the reverse, necessitating a change in the emphasis of doctrinal teaching in order to produce the same overall result. The prevalent Christian message for centuries has been about the person of Christ, His shed blood, grace, salvation, etc. to the exclusion of the importance of keeping God's law which Jesus and the apostles knew so well. Consequently, owing to opposing religious situations and circumstances, in order for the Church of God to clearly present to the world precisely the same overall concept of God's total revelation as did the early New Testament church, it is essential that more emphasis be put on keeping God's law. What we preach and practice today is, in the final result, as close as possible to what the apostolic church preached and practiced. Whatever differences there may be only reflect either cultural disparities and/or shifts in stress or accent needed to generate the desired doctrinal identity. Another demonstration of God's Church is its fidelity to the Word of God. While recognizing that it has developed a certain body of traditional beliefs, interpretations, and practices, the Church of God is unique in its willingness to abandon tradition when it becomes convinced that such is out of harmony with the Bible. The biblical teachings rather than church tradition are considered the absolute standard of right and wrong. Many other churches make this claim as well. However, our own history over the past decades has backed up the claim with decisive action. When certain understanding's and beliefs were examined and found to be incorrect or lacking, they were changed or modified. This fact has produced some astonishment in certain students of religious history because churches as a rule are quite reluctant to go against established tradition and usually greatly resist any movement for change, no matter how much they may also claim to follow the Bible as their ultimate authority. The Church of God is administratively organized in accordance with general biblical guidelines and in a manner viable in this 21st century society. The head of the Church is Jesus Christ (Eph. 1:22-23), who leads and inspires the Church and its leadership through His Holy Spirit. Under Christ in authority are the ministers, theologians, and Church executives who fulfill religious and administrative responsibilities respectively in accord with such scriptures as I Corinthians 12:28-30 and Ephesians 4:11-13. Throughout biblical history, God's Church has had a relatively unified basic commission-that of carrying God's message to those who have yet to hear and accept it. Two scriptures which outline this commission are Matthew 24:14 and Matthew 28:29-30: "And this gospel of the kingdom shall be preached in all the world for a witness unto all nations;...Go ye therefore, and teach all nations, baptizing them...(and] teaching them to observe all things whatsoever I have commanded you. . ." (v. 19-20). This message may at times be delivered through speaking, writing, by one's very life or any combination of these and other possible means. But regardless of the means, to preach the gospel to the world is the express purpose, goal, commission and very reason for being of the Church. Consequently, the central thrust of the leadership of God's Church today is towards preaching the gospel which is referred to both as an "announcement" and as a "witness and warning." The membership realizes that the purpose of the Church is for the preaching of the message and not merely for its own spiritual sustenance. The membership is wholeheartedly and enthusiastically behind this effort; indeed they recognize that the purpose for their own calling now is to help do the Work of God in addition to growing in their own Christian development. Although the Church is described as a comparatively small group or flock (Luke. 12:32; Mt. 7:14), Christ nonetheless assigns it an awesome task to fulfill. The members are to be worthy ambassadors for Christ (2 Cor. 5:20)-i.e. effective representatives of the godly way of life-and proclaim to the world God's plan for mankind. They are required to let their "manner of life be worthy of the gospel of Christ" (Phil. 1:27), i.e. they should be a positive example of Christianity in presenting the gospel to the world. The Church recognizes that its local congregations are a powerful means by which the gospel may be preached both through the example set by the membership of true Christianity and through the effect that the local congregation should have on the community it serves. The objectives of the local congregation include more than just the spiritual development of its members. Every congregation supports the work of preaching the gospel worldwide. Every congregation also serves as a nucleus for new converts. It also fosters educational programs to help all from the very young to the very elderly to grow in the knowledge of Christ. But "pure religion" involves more than preaching; it is a way of life exemplified by the biblical teachings of "love of God" and "love your neighbor as yourself. " The local congregations of the Church of God endeavor to bear the burdens of the needy and be a light to their communities through service to their fellow man and by the example of their personal lives (James. 1:27). Since the first qualification for being able to help others is for the individual himself to be a living success, the Church actively seeks to develop the potential of each member through nationwide programs for its adults and its youth. These programs are designed to aid each individual in sustained, personal growth and development so that all might better reflect God's way of life to those around them. But personal development is not satisfying unless it can be channeled in a productive and creative way. Jesus exhorted His disciples to come to the aid of those in need (Mt. 25:34-36). Such humanitarian activities are the highest expression of love for God and one's fellow man (v. 45). Therefore, the Church of God recognizes this God-enjoined responsibility and strongly encourages each local congregation "as we therefore have opportunity, let us do good unto all men, especially unto them who are of the household of faith" (Gal. 6:10). And though the Church does not promote a lay-ministry concept it is firmly believed that each member can be a powerful witness for Christ by living a truly exemplary life of service and growth (1 Pet. 2:9-17). Members of the Church of God are encouraged through weekly Sabbath services, periodic Bible studies and other religious and social events, to learn the true qualities of Christianity that are expressed in love for God and love for neighbor. This love for one's neighbor means that a true Christian will help his fellow man both in and out of the Church in every reasonable way. A true Christian will set an example of hard work on his job, during recreation and in all aspects of daily life. His example of leading a godly life should positively influence those around him and serve as his personal and individual witness of the truth of the gospel of Christ. Historically, the example of the membership of God's Church in the community has had a powerful effect on those with whom they came into contact. Likewise, as a group, the combined membership of a local congregation-led by its minister-may, as a the opportunity arises, serve its local community during disaster or time of special need. Once again, the positive Christian example of such a local congregation in the community will be a great testimony to the proper principles of God. Thus the working nucleus of the Church of God, letting its "light so shine before men" (Mt. 5:16), is the local congregation. Members of God's Church are therefore exhorted to attend the religious activities of the Church. These are not ends in themselves but directives of God, designed to spiritually strengthen the individuals and the local congregation as a whole so that the light of their Christianity might burn more brightly. This policy is in accordance with the command of God that Christians should not neglect to meet together (Heb. 10:25). This scripture is actually a warning from Paul to Christians "not to forsake the assembling of ourselves together as the manner of some is" (Heb. 10:25). This warning was made in the realization that daily cares can distract us from God and His plans for us. Meeting together regularly on God's weekly Sabbath and His annual holy days provides Christians with the opportunity to have spiritual goals reestablished and spiritual vision renewed. One who would habitually neglect Church services, with the exception of circumstances beyond his control, is neglecting an important aspect of his spiritual life. Local Church services also provide the community, as well as the membership, with an open meeting to hear the truths of God that the minister expounds from the Bible. As already mentioned, the Church of God traces its spiritual history back to the apostolic church of the New Testament. This claim is founded on the fact that what we believe and teach in the twentieth century are the same basic doctrines that the original Church believed and taught in the first century. Jesus said, "I will build my church, and the powers of death shall not prevail against it" (Mt. 16:18). Consequently, we believe that God has always had, from Christ's time to this, some faithful group which He has used to perpetuate and propagate His truth. Although the Church of God recognizes that its recent history is short, it sees many spiritual and doctrinal predecessors through the last two millennia and traces its history genealogically as well as spiritually to the New Testament Church. It has never been the responsibility of God's Church to evangelize for the express purpose of proselyting new members. God is the one who calls persons to His Church by opening their minds to His gospel (John. 6:44; Rom. 9:15-16). Nevertheless, as a result of the preaching of Christ's disciples, new converts-as called by God (John. 6:44) and in numbers God chooses (Acts 2:47)-are brought into the Church. Here they are nurtured through God's Word and helped by the ministry and each other to grow in grace and the knowledge of their Lord and Savior, Jesus Christ (2 Pet. 3:18). 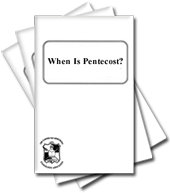 Acts 2 - Church begins on day of Pentecost after the ascension of Jesus Christ. Acts 2:47 - The Lord adds to the church. 1 Corinthians 12 - God's church is a unified organism. 1 Corinthians 3:9-17 - The church is a spiritual building. Ephesians 3:15 - The members of the church are spiritually related to each other. Romans 8:29 - We are the siblings of Christ. Hebrews 2:10 - Jesus leads the church members and directs their way. 1 Corinthians 1:2; 2 Corinthians 1:2; Galatians 1:13; 1 Timothy 3:5 - Name of church is Church of God. Ephesians 5:22-32; Revelation 21:9 - Members live in a state of expectation and preparation for the bridegroom. John 6:44 - a person must be called by God to the church. Luke 14:28 One must count the costs before baptism. Romans 14:13 - Do not judge one another. 2 Corinthians 10:12 - Do not make spiritual comparisons among yourselves. 1 Corinthians 1:11-13 - Do not form cliques, favoring one minister over another. Colossians 2:19 - The church is a spiritual entity. 1 Corinthians 12:13 - By one Spirit we are all baptized into one Body. Romans 8:9 - If any man has not the Spirit of Christ, he is none of His. Ephesians 4:4-5 - There is one body, one Spirit, one Lord, one faith and one baptism. Ephesians 1:22-23 - Christ is the head of the church. 1 Corinthians 12:28-30; Ephesians 4:11-13 - Offices and positions in the church. Matthew 24:14, 28:29-30 - The commission of the church to preach the gospel. Luke 12:32; Matthew 7:14 - The church is a small flock. 2 Corinthians 5:20 - We are to be ambassadors for Christ. Philippians 1:27 - Let your conduct reflect the gospel of Christ. James 1:27 - Definition of Pure Religion. Matthew 25:34-36, 45 - Come to the aid of those in need. Galatians 6:10 - Do good to all people. 1 Peter 2:9-17 - Be a powerful witness for Christ by your godly behavior. Matthew 5:16 - Let your light shine before men. Hebrews 10:25 - Do not forsake the assembling of yourselves together in church services. Matthew 16:18 - Jesus said He would build His church and the gates of hell would not prevail against it. John 6:44; Romans 9:15-16 - God calls people to His church. 2 Peter 3:18 - Grow in the grace and knowledge of the Word and Savior Jesus Christ. 1] The greatest truth of the Bible is that God is reproducing Himself through mankind. True or False? 2] Humanity's goal and purpose of existence is, ultimately, to enter God's family and to become literal sons of God. True or False? 3] Humans are immortal, born with an immortal soul. True or False? 4] The fact that human beings were made with the potential and destiny of entering God's family is fundamental to our knowledge of who and what we are. True or False? 14] All people who call themselves "Christian" today are part of God's true church. True or False? c. grace and the keeping of the Law. 19] To preach the gospel to the world is the express purpose, goal, commission and very reason for being of the church. True or False? 20] The membership is wholeheartedly and enthusiastically behind the commissions and Work of the church. True or False? 21] The Bible describes the church as being a large church with tens of thousands of members throughout the world. True or False? 22] Members are to be effective representatives of the godly way of life and be worthy of the gospel of Christ. True or False? 23] The local congregations are a powerful means by which the gospel can be preached. True or False? 25] The second commission of the church is to feed the flock. That is, to develop the potential of each member through sustained personal growth and development. True or False? 26] Jesus exhorted His disciples to come to the aid of those in need. Such humanitarian activities are the highest expression of love for God and one's fellow man. True or False? 29] Meeting together regularly on God's weekly Sabbath and Holy Days provides Christians with the opportunity to have spiritual goals reestablished and spiritual vision renewed. True or False? 30] The Intercontinental Church of God teaches and believes in the same basic doctrines that the original church believed and taught in the first century. True or False?